Happy mothers day to human and animal mothers everywhere from The Antarctic Book of Cooking and Cleaning. Precious pups. “Usually, a single pup is born but twins have been reported. Newborns weigh about 30 kg at birth, are covered with soft, gray pelage that is molted in four to six weeks to the adult pelage. At birth, young have a full compliment of adult teeth. Pup survival appears to increase with age and experience of the mother with the highest pup mortality occurring to first-time mothers. Weddell seal mothers remain with their pups and fast for at least part of lactation and lose considerable body mass during lactation. When lactating females resume foraging, they may dive deeper and longer to catch in an effort to restore their own energy stores, which have been depleted during lactation. Pups are weaned at about six weeks and reach full adult size in about three years. Reproduction generally appears to be delayed until age four to five for females and six to seven for males. The National Zoo’s Antarctica Expedition is sponsored by the National Science Foundation’s Office of Polar Programs. 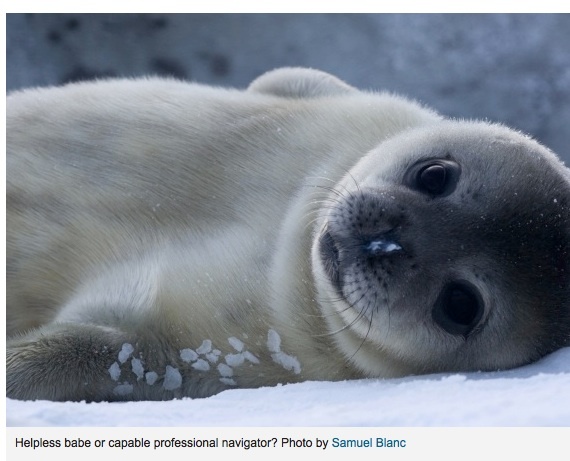 All photographs depicting Weddell seals were taken under NMFS Permit No. 763-1485-00 issued under the authority of the Marine Mammal Protection Act. 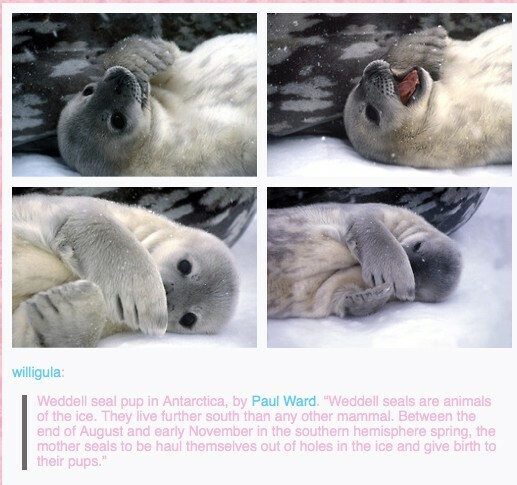 ps happily, at this time Weddell seals are not officially considered endangered, but they are a protected animal. (the IUCN – International Union for Conservation of Nature considers them an animal of Least Concern. Humans are also in this category.) Are humans endangered? Lets go for not!